Mother Lakshmi arose out of the sea of milk, the primordial cosmic ocean, bearing a red lotus in her hand. Brahma, Vishnu and Shiva (creator, preserver and destroyer respectively)- wanted to have her for themself. Shiva’s claim was refused for he had already claimed the Moon, Brahma had Saraswati, so Vishnu claimed her and she was born and reborn as his consort during all of his ten incarnations. The word ‘Lakshmi’ is derived from the Sanskrit word Laksya, meaning ‘aim’ or ‘goal’, and she is the goddess of wealth and prosperity, both material and spiritual.. In the avatars of Lord Vishnu, Lakshmi also took various forms to accompany him – Sita with Rama, Rukmini with Krishna. She wears gold embroidered red clothes. Red symbolizes activity and the golden lining indicates prosperity. Ashta Lakshmi are her eight forms which are the commonly worshipped aspects. In each form, she bestows one form of wealth to her devotees. Her four hands represent four spiritual virtues. The lotus seat, which Lakshmi is s upon, signifies that while living in this world, one should enjoy its wealth, but not become obsessed with it. Such a living is analogous to a lotus that grows in water but is not wetted by water. Since the right side of the body symbolizes activity, a lotus in the back right hand conveys the idea that one must perform all duties in the world in accordance with dharma. This leads to moksha (liberation), which is symbolized by a lotus in the back left hand of Lakshmi. The golden coins falling on the ground from the front right hand of Lakshmi illustrate that She provides wealth and prosperity to Her devotees. Her front left hand is shown bestowing blessings upon the devotees. There are not as many temples for Lakshmi as for Sakthi (Parvathi), she is however worshipped in temples, more so in the north of India. There are numerous poojas and festivals, which are performed to invoke her blessings. She is adored by Lord Ganesha. Householders worship Lakshmi for the well being and prosperity of the family. Businessmen and women also regard her equally and offer her daily prayers. Lakshmi Puja is celebrated on the full moon night of Kojagari Purnima. 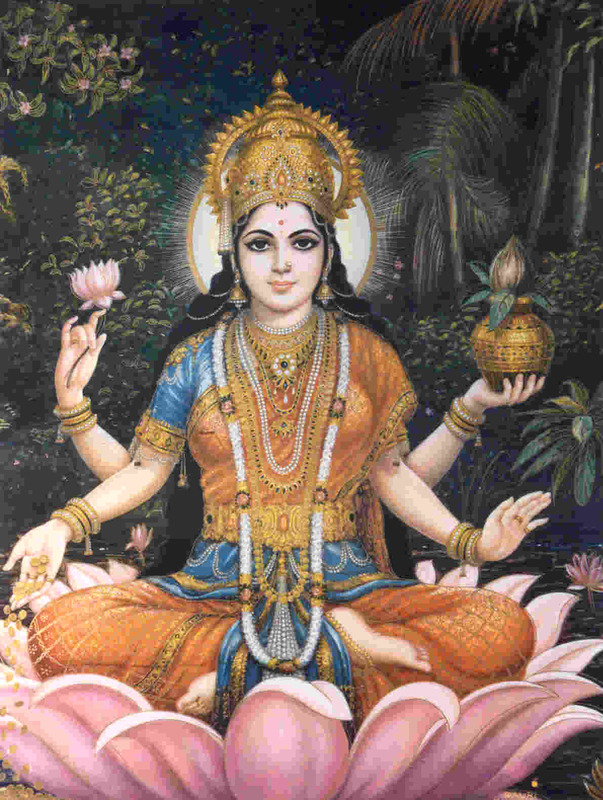 Lakshmi arose out of the sea of milk, the primordial cosmic ocean, bearing a red lotus in her hand. Each member of the divine triad- Brahma, Vishnu and Shiva (creator, preserver and destroyer respectively)- wanted to have her for himself. Shiva’s claim was refused for he had already claimed the Moon, Brahma had Saraswati, so Vishnu claimed her and she was born and reborn as his consort during all of his ten incarnations. Since the right side of the body symbolizes activity, a lotus in the back right hand conveys the idea that one must perform all duties in the world in accordance with dharma. This leads to moksha (liberation), which is symbolized by a lotus in the back left hand of Lakshmi. The golden coins falling on the ground from the front left hand of Lakshmi illustrate that She provides wealth and prosperity to Her devotees. Her front right hand is shown bestowing blessings upon the devotees. She is adored by Lord Ganesha. There are not as many temples for Lakshmi as for Sakthi (Parvathi), she is however worshipped in temples, more so in the north of India. There are numerous poojas and festivals, which are performed to invoke her blessings. Diwali, the festival of lights, is also an occasion for Lakshmi Puja. Three days during Navarathri are also celebrated for Lakshmi. On the full moon night following Dusshera or Durga Puja, Hindus worship Lakshmi ceremonially at home, pray for her blessings, and invite neighbours to attend the puja. It is believed that on this full moon night the goddess herself visits the homes and replenishes the inhabitants with wealth. A special worship is also offered to Lakshmi on the auspicious Diwali night. Year after year we have seen the lamps being lit for Diwali, the birthday and the wedding day of Goddess Lakshmi.